The freezer compartment of your refrigerator can be finicky at times. If there is a problem with any component in your refrigerator, the freezer compartment is more likely to show signs of it than the refrigerator itself – at least at first. So, if you notice a problem, it’s in your best interest to have it inspected and repaired as soon as possible, before it begins to affect other parts of your fridge. 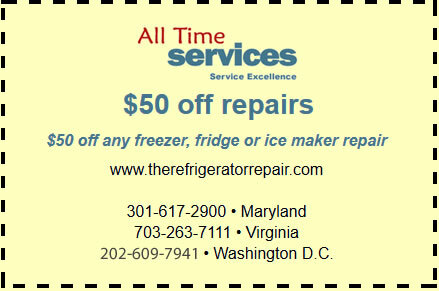 Whenever a problem crops up in your freezer component, you want the best local freezer repair technicians on the job. If you live in the greater Washington D.C. area, All Time Services is the place to call. If you’re tired of dealing with problems like excess frost in your freezer or ruined food, call us today to learn more about how we can help. A freezer is designed to dehumidify and freeze foods. However, if excess humidity is allowed to build up – either because the system isn’t working properly or because of a bad seal on the freezer, you may start to see excess frost. The most common problem is a broken door gasket which can be fixed for very little money. Another possible time is the defrost heater which may not be working properly due to a bad heating element or to the timer not working properly. Have both inspected to find out why you are getting excess frost. There are number of problems you might notice in the freezer compartment of your refrigerator. The most common problem is that the appliance simply doesn’t work. There are a number of possible causes for this. Often this means there is a problem with the thermostat or with the defrost timer. However, when fixing these components isn’t enough, a more thorough inspection of the compressor is needed. Another common problem is a frozen evaporator coil, though this doesn’t happen as often with newer models (unless there is another problem in the appliance). If you have an older unit, you may need to manually defrost your freezer. Freezer compartment frost build up is one of the more common issues we deal with, usually due to a damaged door gasket or a problem with the defrost timer. If excess outside air gets into the freezer, the humidity in it will freeze quickly. If that excess air isn’t defrosted by the self–defroster, your freezer will build up extra frost – usually a sign something needs to be repaired. There are a number of problems that can cause these issues and the only real way to know for sure that they’re solved correctly is to have a professional take a look. 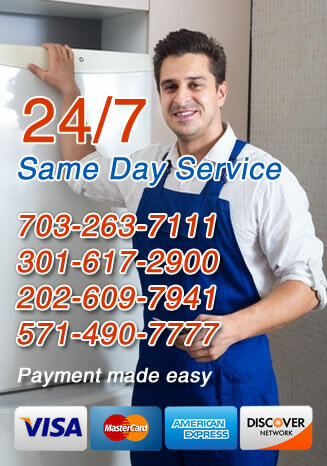 For freezer compartment repair service in Washington, DC, Virginia, Arlington, Gaithersburg, Arlington, VA, MD and the surrounding areas, you need to call the technicians at All Time Services. Whether it’s a defrost timer or way too much frost in the compartment, we’ll identify and solve the problem fast.